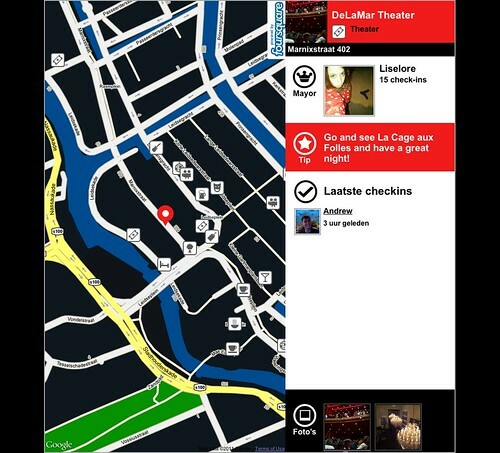 For the Amsterdam UIT Bureau and I Amsterdam we created this Foursquare map designed to display nightlife activity around the Leidseplein (entertainment) area with recent checkins, specials and current mayor and photographs of a selected group of venues. We strongly believe in creating autonomous displays that take cues from the environment —in this case using Foursquare— and deliver clear actions to the audience as well as a sense that the area they are in is alive and all they have to do is go out and connect to it. The project is live at its own URL and in an iframe on the IAmsterdam site. Technically we used Foursquare’s OAuth2 API which is outstanding. To be able to share one token across all requests we employ a file based PHP cache that relays the necessary requests for us. Main technology was created in collaboration with Panman Productions.